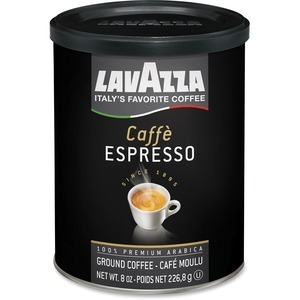 Cafe Espresso is a 100 percent Arabica blend of the highest quality beans that have been carefully selected and evenly roasted to produce a coffee smooth in flavor with a tempting aroma. Coffee beans are pre-ground for espresso machine use, filter coffee machine, French press and stovetop moka brewing. Vacuum-packed can features a resealable lid to keep the dark roast fresh.